One of the great services libraries offer to their communities is to act as a storehouse of local and personal histories. Filed between numerous photos, post cards, prays and poetry are often found newspaper clipping on anything that happened to catch the scrapbooker’s eye. This can range from a story about a cute baby with “the large, doll-like eyes” to a triple homicide committed by a jilted lover. People like to think that the world has become more weird and dangerous since the early 20th century even when that is not the case, but our perception of it has changed from the constant barrage of news available to us. Now 24/7 hours a day you can hear about a new murder or crime committed somewhere, which can mess with our perception of how dangerous the world actually is. Nevertheless, as they say in journalism, if it bleeds, it leads. It is these stories that people, regardless of the era, are compelled to see and remember. That included your great-grandmother. 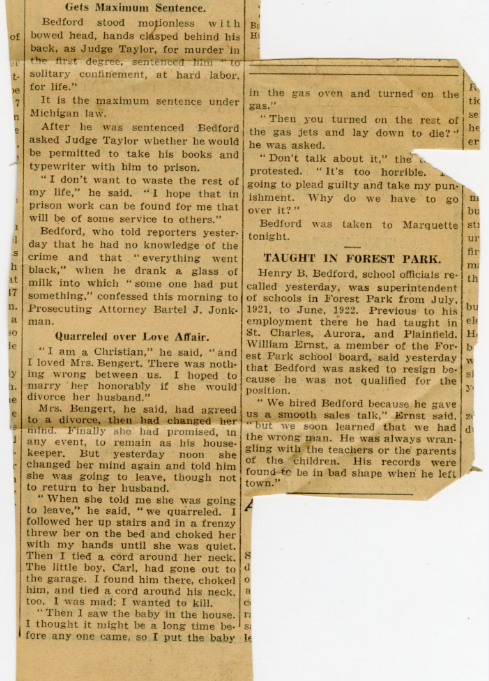 The following examples of local intrigue and scandal were found in the course of my work with Plainfield Public Library to digitize scrapbooks and local documents. These examples come from the very thick scrapbook of Lavina Birkett Harvey Irwin, which was graciously donated by her great-granddaughter. Unfortunately she did not save the picture. My favorite part is that he claimed “he had no knowledge of the crime and that “everything went black,” when he drank a glass of milk into which “some one had put something.” This should be a lesson to all of us about avoiding strange milk, it’s a killer. While not an actual listing of the murders, it’s still very morbid. You would think the third husband would have been suspicious about what happened to the last two. Maybe she put it in the milk? I’m pretty sure children are less than 20 years old. Here we have a classic Depression era bank robbery with hostages and a gunfight with police. You wouldn’t expect a crime like this in a small town like Plainfield, let alone two. Next Post “They Shall Not Grow Old” – WATCH IT!